Eligible candidates can apply through the official website i.e. jakbopee.net and must also read all the instructions given in the e-brochure. 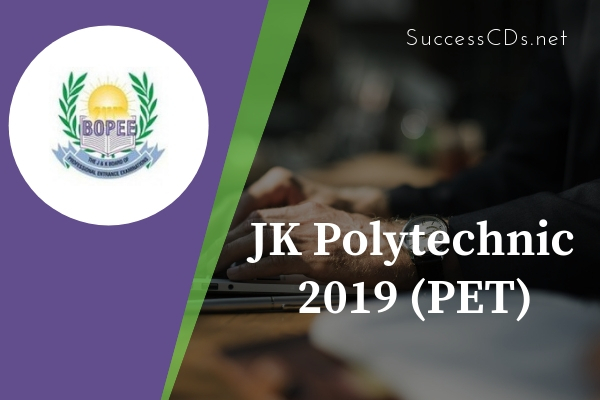 The Jammu & Kashmir Board of Professional Entrance Examinations (BOPEE) conducts Entrance Examination and selecting candidates for admission to three-year Diploma in Polytechnic Courses. For the academic year 2019, the BOPEE shall recommend candidates for admission to the first semester of various full-time diploma programs either through entrance test or on the basis of academic merit of qualifying exam of the candidates depending upon the number of applications received. Private Colleges in Jammu Division: NITS Polytechnic, Miran Sahib/IECS, Doman/Acharya Si- Charitfet Tech. Institute, Chop Manhasan. Civil/Electrical/Mechanical/Electronics & Communication/Auto-mobile/Computer/Leather Technology/Wood Technology/Information Technology/ Garment' Technology/ Office Management' & Computer Application/ Medical Lab. Technology/Food Technology/Textile Technology/Medical Electronics/Travel 8i Tourism/Architectural Assistantship/Quality Survey and Construction management/any other Course as may be notified. A candidate must have passed Science and Math subjects in 10th class examination at the time of counselling and secured percentage of marks as given above. Those who have appeared in the Matriculation Exam up to the last date i.e. 03rd February 2019 are also eligible provided they have qualified the exam at the time of the declaration of the result of the BOPEE examination/at the date of counseling as may be notified by the Board. Note: There is no upper age bar for appearing in the Entrance Test for admission to Polytechnic Courses, both in Government and Private Colleges. The fee indicated above shall be inclusive of all the fees. The institution shall charge no other fee from the students in the name of admission fee, sports fee or any other fee. However, the fee payable to the J&K State Board of Technical Education on account of exam/registration etc. shall be charged extra as per the fee fixed by the State Board of Technical Education. The candidates are advised to download their Admit Cards from the BOPEE official Websites www.jakbopee.net or www.jakbopee.org or www.jkbopee.in on photo paper printed in colour; the candidates will be informed through a separate notification regarding the date for downloading of admit cards. The entrance test will be held at the centres specified by the Board in the cities of Srinagar and Jammu only. The PET 2019 will consist of one question paper having 180 multiple-choice questions. Each correct answer will carry one mark and each wrong answer will carry -0.25 marks. Candidates who will appear for the entrance test must go through the exam pattern to have a better understanding regarding the entrance test. The Application Forms have to be submitted online only through BOPEE websites www.jakbopee.org / www.jakbopee.net (through URL’s/links provided for this purpose) within the prescribed date to be notified separately. The payment of rupees Rs.450/- only as fee is to be made online through "Integrated Payment Gateway" with the help of any national Credit Card/Debit Card/facility. The procedure for filing Application Form and eligibility etc of the candidates have been given in detail in the E-Brochure. The students must necessarily, in their own interest, go through this Brochure before attempting to fill up the online Application Form. The candidates can download admission notification, Brochure, instructions, Admit Card and all other relevant information from the official website of the BOPEE at any Common Service Centres of J&K State at nominal charges. They can also avail the services at any National Informatics Centre located at the office of the Deputy Commissioner of the concerned District. Candidates are advised to remain in touch with the BOPEE website wwww.jkbopee.gov.in and also go through the e- Information Brochure before filling up of the application forms.